Democrat was governor too. But in 2008 and 2010, voters (including me) approved initiatives that took redistricting out of the hands of the legislature and gave it to an independent commission charged with creating compact, nonpartisan district lines. 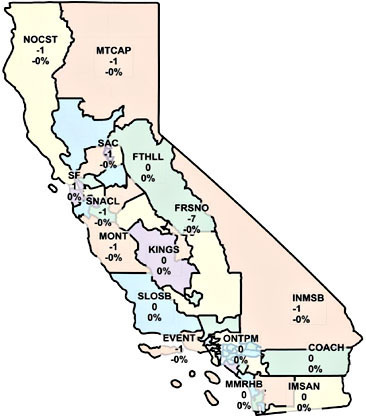 Yesterday they released their map of California’s new districts. So what happened now that Democrats are no longer in charge? You’re looking at three to five Republican members of Congress that just kind of vanish,” said Matt Rexroad, a Republican political consultant in Sacramento who advises clients on redistricting. The prospect of Democrats securing two-thirds of both state legislative houses is “very much in play,” he said. No single party has held a supermajority in both the Assembly and Senate in many decades. ….In Washington, some GOP strategists expressed confidence that Republicans would be able to compete in some of the proposed new districts that appear to favor Democrats, possibly limiting the loss of seats to just one or two. But analysts were predicting otherwise. “At minimum, [Democrats] should pick up two to three seats, but that could go as high as four to five,” said David Wasserman, House editor of the Washington-based Cook Political Report, which monitors redistricting. Welcome to California. After decades of gerrymandering warfare that usually ended up in the courts, Democrats in the Golden State took a different tack in 2001. Instead of gerrymandering for maximum partisan advantage, they made a nice, cozy arrangement with their GOP rivals: gerrymandering with the primary goal of protecting incumbents of both parties. It made everyone happy. Especially incumbents. Democrats largely opposed the initiatives that created the new redistricting commission. (So did Republicans.) The new map shows just how self-destructive that was. Their districts aren’t quite as safe as they used to be, and they may have to work a little harder to hold onto them. But as my mother always said, hard work never killed anyone. In this case, despite their best efforts to avoid it, hard work will likely make California even more solidly Democratic than it is now.